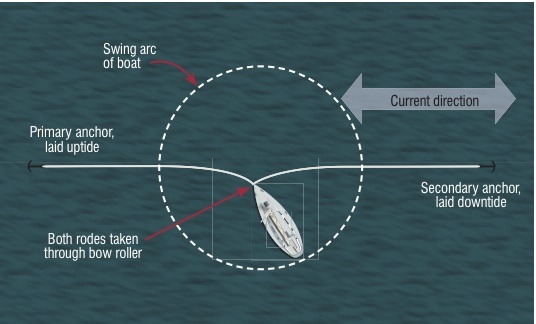 According to the textbooks, when you anchor you need to allow enough room for your boat to describe a complete circle around her anchor without overlapping with the swinging circles of other boats. The more scope you deploy, the better the holding, and the better the shock-absorbing effect of the catenary of rode stretching towards the sea bed. The reality, however, is that it’s often impossible to use as much scope as you would like. You might be limited by the proximity of other boats, by an area of poor holding, or by geographic issues such as the shoreline or an area of shallow water. Small or shoal draught boats in calm weather often hold an advantage here as they can anchor in shallower water than many, reducing their required scope and hence their swinging circle. The cardinal rule of anchoring etiquette is ‘first come, first served’ so, however inconsiderately you think another boat might have anchored, if they got there first you need to go elsewhere. If you have to anchor among other boats, try to choose boats of similar size, windage and underwater profile, as they will tend to lie to wind and tide in a similar fashion to your own boat and allow you to get away with partially overlapping swing circles. With a fluke-type anchor, it’s easy to illustrate the effect of increasing scope on the holding power of an anchor: more is clearly better! With few exceptions, anchors work by orientating themselves on the seabed and digging in, first at the tip and then expanding the hole to take an ever-broadening section. They are designed so that the chain or rope follows the line of the anchor along the seabed before arcing upwards towards the boat. When deployed properly, the rode should lie flat for some distance; to break the anchor out the rode is shortened until it descends vertically from the boat’s bow roller. This twists the anchor out of the ground and releases its hold. To keep the rode flat to the seabed you usually need plenty of scope. Accepted guidelines are three times the maximum expected depth of water for an all-chain rode, five times the depth for a combined chain/warp rode and seven times for a rope rode, but if you have the space, don’t be afraid to use more. The simplest way to reduce your swing circle for the same security is to use an all-chain rode. The heavier the rode, the greater the tendency to lie flat to the seabed and the straighter the pull on the anchor. However, chain is heavy to carry, unpleasant to handle and can be noisy, so many boat owners opt for a part-chain, part-warp rode to add some weight near the anchor. Another way is to make your rode heavier by simply adding a weight. Anchor chums or angels are heavy weights, often lead, that are lowered down the anchor rode after you have anchored. By pulling the catenary of the rode towards the seabed, they straighten the pull on the anchor and reduce the swinging circle. They also make an effective shock absorber by resisting the rode pulling straight and snatching, for which reason many boat owners use them whenever they anchor. This classic two-anchor configuration involves laying your hooks in a ‘V’, angled between 45° and 90°. To deploy the anchors, lay the first anchor as normal, allowing the boat to drop back and the hook to set. Then, motor upwind (or uptide, whichever is the stronger) and to one side of the first anchor, laying the second at a similar distance from your intended resting place. Drop back and set the second anchor, then adjust the rodes and balance the load between the two. If the wind or current shifts, you may need to rebalance: to retrieve the anchors, motor up to each in turn. 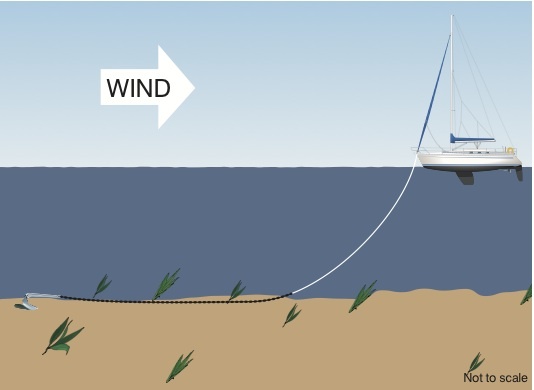 This approach has clear advantages in, for example, a situation where a single anchor with adequate scope might allow you to swing over shallow water at the channel edge. It also allows you to lay an anchor towards an expected wind shift. However, in poor holding areas its only advantage is that you have two chances for an anchor to hold, as unless the wind and/or tide is consistent, one anchor will always take more load than the other. To increase an anchor’s hold in an area of poor holding or if the weather is expected to worsen, consider laying two anchors in line. Secure your kedge or, better still, a larger anchor, to the tandem anchor attachment point on your primary anchor. This point should be at or adjacent to the point when the main anchor chain attaches, and the link should be at least as long as the boat and should be made from chain. 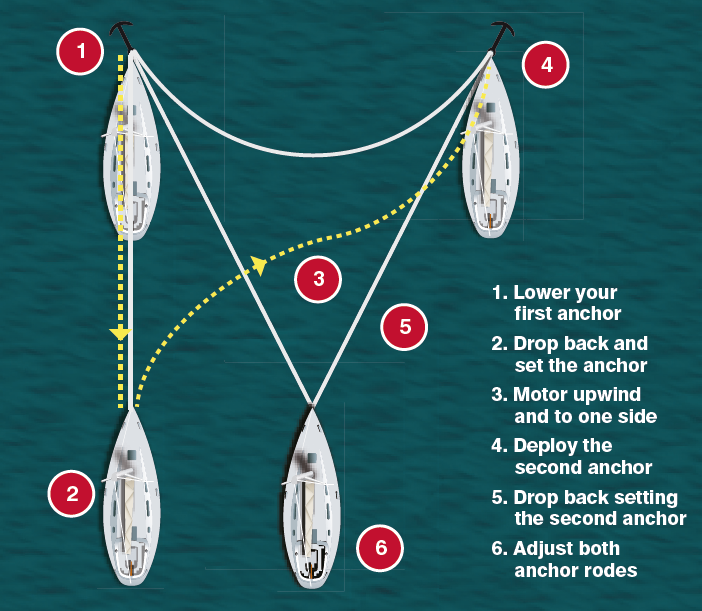 When deploying the anchors, lower the secondary anchor first, and allow the full length of chain between the two to pay out before lowering the primary anchor. Set the two together as normal, then pay out the remaining rode. Retrieval is the reverse process, as you have little choice but to break out the anchors sequentially. The process can be aided by attaching one end of a floating retrieval line to the shank of the primary anchor, and the other end to the shank of the secondary anchor. 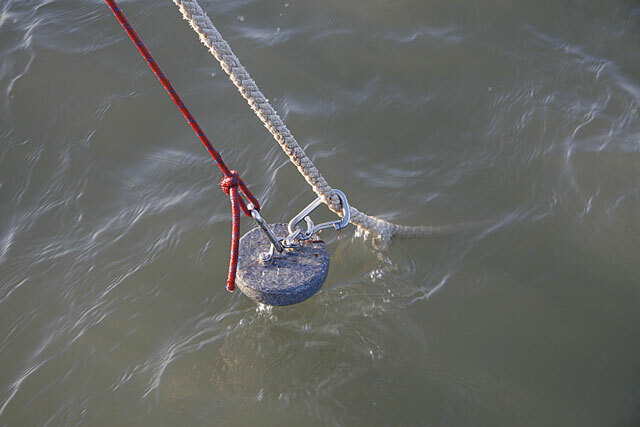 Tests have shown this technique can increase holding power by up to 30% over a single anchor, and is hence a useful technique for heavy weather. 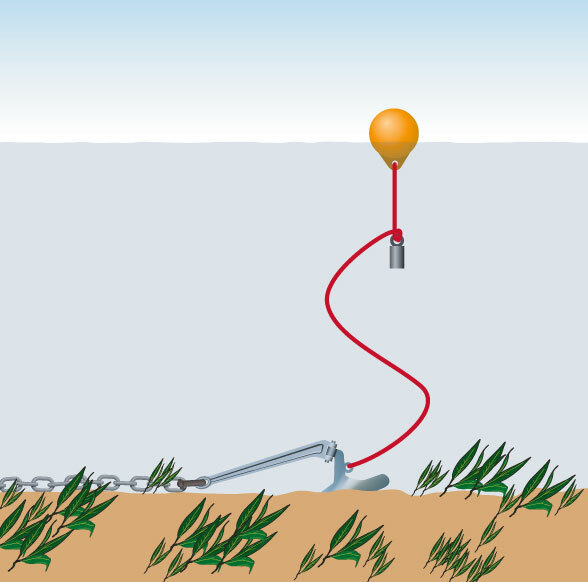 However, if the anchors do start to drag, the secondary anchor stands little chance of resetting as it drags into the ground already disturbed by the primary anchor, so a careful anchor watch is essential. If you really must limit your swing, or want to avoid your anchor having to reset when the tide turns, the Bahamian moor is an oft-neglected but useful technique. It is of particular value in tidal areas of poor holding where you can see the bottom, as once both of the anchors are set they do not need to move again until you are leaving the anchorage. The idea is simple. The first anchor should be laid uptide as normal, while the second should be laid downtide on a similar scope. Both rodes are taken through the bow roller, providing a single fixed point around which the boat can swing in a circle little larger than a boatlength in radius. 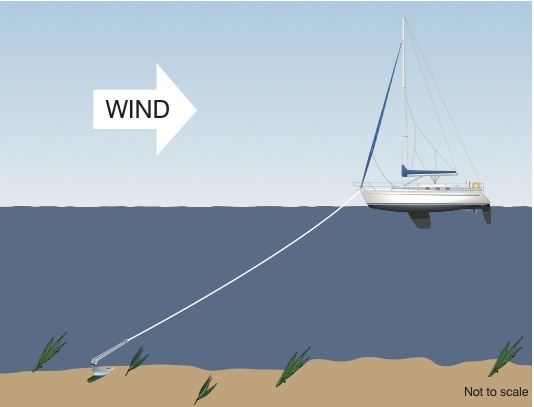 This allows the boat to lie to a combination of wind and tide – usually the most comfortable angle. Deployment is harder to achieve. You either need to drop back by double your intended scope on the first anchor to lay the second, or lay the second anchor from the dinghy. As it’s virtually impossible to row out a chain rode, this requires that you either have a rope or rope and chain combination rode on the second anchor. Retrieval is a little easier if you buoy the second anchor rode and let it slip, so that they can be dealt with one at a time. Although good in strong tide, if there is a strong crosswind significant twisting forces will be placed on the anchors. Lengthening the rodes to make a V configuration may then be more appropriate. Similar to the Bahamian moor, but with bow and stern anchoring you secure the second anchor at the stern. This eliminates swing, but it can be highly unpleasant and even dangerous if there is any chance of waves coming from astern. 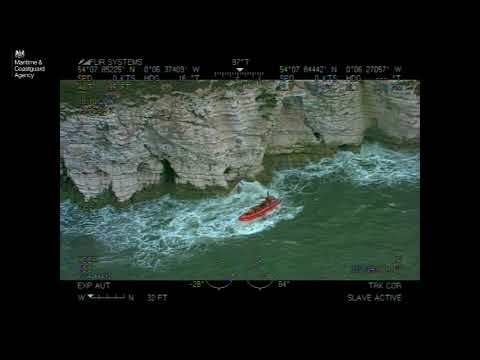 For this reason it is only a suitable technique to use in sheltered water, perhaps at a channel edge where any swing would set you aground. In areas where your anchor may become fouled by weed, rocks or litter on the sea bed, it’s worth rigging a tripping line. This line is secured at the crown of the anchor and either buoyed and left to float over the anchor, or made fast further up the rode at a point a couple of metres beyond the maximum depth of water. In crowded anchorages it’s best to use the latter option with a floating line: as you haul in on the anchor, the tripping line will come to hand and allow you to release the hook. If you use an anchor buoy, hang a weight on the line a few metres below the buoy to keep it hanging down out of harm’s way. If the anchor does become fouled and you did not fit a tripping line, one can still be deployed. Attach a suitable line to a large shackle or ring and place the shackle over your rode. Let the shackle sink, guided along the rode to the anchor: it will need some help, so gently motor along the line of the rode or, better still, follow it with the dinghy. Pull the shackle up to the crown of the anchor and trip the hook. There’s a world of difference between being anchored safely and being anchored comfortably. Your boat could be tied with a three-inch cable to the wreck of HMS Royal Oak, but in the wrong conditions you still won’t get a wink of sleep. if the boat is sailing over her anchor under bare poles – a drogue streamed astern may solve your problem. This can also be effective in controlling excessive pitching. If she needs to lie aligned to the wind, try a riding sail. A storm jib hoisted on the backstay can be a good substitute. of the boom and swung out over the side. The device damps the roll as it is dragged upwards through the water. A second flopper-stopper poled out on the other side will damp the roll in both directions. 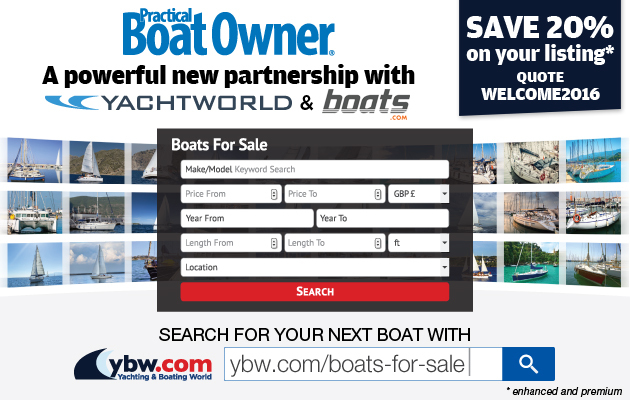 A final technique worth considering is to use a bridle, formed by taking a line forward from the aft quarter of your boat to the anchor rode and made fast with a shackle or rolling hitch about a boatlength forward from the bow. This can be used to bring the bow into the swell, but it will put significant extra load on the anchor, so it should only be used in settled conditions. Give Two Hooks a try! It’s rare to see a boat in the UK lying to two anchors, but maybe that’s something that could change. Picture the scene: you creep into a crowded anchorage, run close inshore and drop the hook. Neighbours scoff, but are surprised when instead of lying to your first anchor, you motor away from the shore and lay a second. When the tide turns, the second anchor rode tautens as the boat tries to drift towards the beach, holding her safely in deep water. You have less far to row ashore than anyone else, and also have the peace of mind that two hooks need to drag before you’re in trouble. That’s a low risk example, but these are techniques which are worth keeping up your sleeve nevertheless. All sailors know that there are times when going to another anchorage just isn’t an option – if some seamanship skills can help you stay safely where you are, then they’re skills well learned. Happy Hooking: The Art Of Anchoring, by bluewater cruisers Alex and Daria Blackwell covers all the techniques mentioned and more, with information on weather, etiquette and rafting, among other things.